The GT-R is the ultimate model in the Mazda Familia line-up - and it's amongst the hottest handful of hatchbacks in the world! 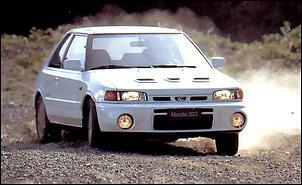 In a previous issue of AutoSpeed we presented you the imported-from-Japan Mazda Familia GT-X. 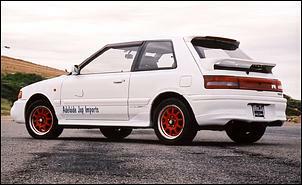 The GT-X is a small-sized 134kW four-wheel-drive turbo that's very similar in spec to the Australian delivered KF/KH Ford Laser TX3 Turbo. But Mazda - feeling a burning desire to get into top-line Group A rallying - followed the Familia GT-X with a homologation special in the same mould as the Subaru STi, Mitsubishi Evo and Nissan GTi-R.
Say hello to the Mazda Familia GT-R.
Like many rally car manufacturers of the early '90s, Mazda did the trick of building the minimal number of GT-Rs (only 2500) so that it could gain approval for Group A competition. Certainly, vehicles such as this were inordinately expensive to design, test and (finally) manufacture - so manufacturers often sold only the minimum required number. 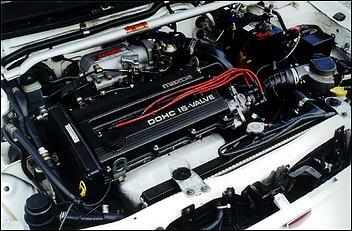 The Familia GT-R uses the same basic 'BP' engine design as the GT-X and the local TX3. 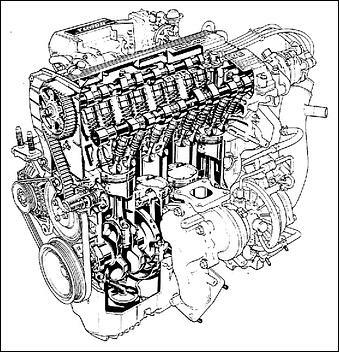 However, the GT-R engine has been significantly reworked by Mazda's Motorsport Engineering Group and features many alterations - the combustion chambers are reshaped, the pistons have raised crowns (maintaining the GT-X's 8.2:1 compression ratio), the rods are stronger and a water-to-oil cooler also went in. The DOHC, 16-valve head received larger (sodium-filled) valves, revised profile hollow cams and various airflow-enhancing mods. Its match-ported exhaust manifold is also new. 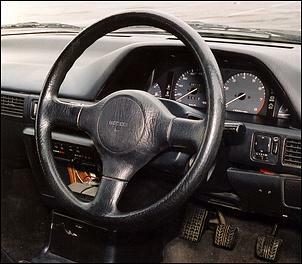 Computer mapping changes were, of course, carried out and the airflow meter and fuel pump are also said to differ from the GT-X. It's relatively easy to squeeze more top-end power from a turbo engine by upsizing the compressor and turbine - and that's exactly what's been done by the factory on this car. The GT-R spins a much larger turbo featuring a ball-bearing centre (the GT-X uses a conventional bearing). Increased power - and durability - also comes thanks to a front-mount air-to-air intercooler that's 70 percent larger than the GT-X model. Okay, enough engineering babble, how much grunt does this little sucker 'ave? Well, bear in mind that the BP engine displaces only 1.8 litres (not 2 litres) and you'll be quite impressed by its 154kW and 250Nm. Note that peak power is attained at the same revs as the GT-X (6000), but the GT-R's peak torque figure arrives a lengthy 50 percent later - 4500 rpm instead of 3000. These figures were grabbed from Japanese Domestic Car Market Book, which means local 100-octane unleaded fuel was probably being used. Note that Mazda knock sensing is responsive to altered fuel octane, so expect the ECU to pull back power and torque when running on lower grade fuel. Like the GT-X, the GT-R comes with a 5-speed manual only. The 'box used in the GT-R is the same design, but - again - engineers reworked what they could. 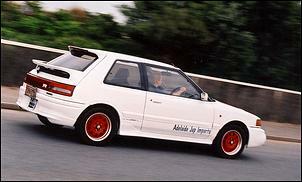 The housing was strengthened, the gears were shot-peened and the hard-working 230mm clutch was also up-spec'd. 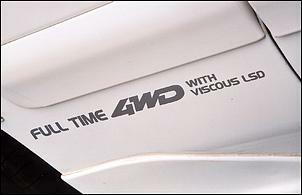 The cost-effective viscous-coupled all-wheel-drive system from the GTX also copped a screwin' around with. The centre coupling gives a 43-57 front-to-rear torque split under static conditions, giving up to 60-40 under high slip conditions. In addition, a viscous LSD went under the rear. On the road, the GT-R shows typical big turbo-small engine characteristics. The first thing you notice is that the engine won't start showing signs of speed until you get it up to around 3500 rpm. It's very obvious that the GT-R has less boost response and pre-3000 rpm torque than its humble GT-X stablemate. Having said that, the GT-R engine remains tractable at all times. Mazda's claimed 7.2 second 0-100 km/h and 15.0 quarter mile times feel about right - though, perhaps you could get quicker with an extra-brutal launch. On the other hand, the GT-R is notably more difficult to get off the line than the GT-X because of its lack of bottom-end grunt. 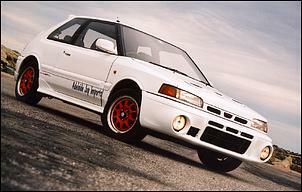 In comparison, the GT-X gets to 100 in around 7.8 seconds. 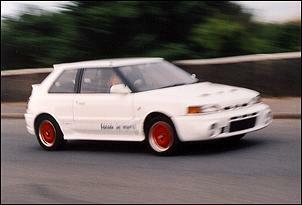 As with any other homologation rally special from the early '90s, the GT-R makes one hell of a public road sprinter; it's incredibly fast and forgiving. Based on the same 2-door 2450mm wheelbase as the Familia GTX, the GT-R also carries over the same suspension description - MacPherson struts at the front and transverse A-arms with trapezoidal twin-link struts at the rear. Just as with the engine and gearbox, however, the basic formula was quite heavily revised - the GT-R gets firmer springs and dampers, firmer bushes, tougher engine mounts, different front alignment and a revised rear linkage giving enhanced toe control. Interestingly, the GT-X's 20mm solid rear swaybar made way for a 19.1mm hollow bar and the solid front swaybar went from 22 to 23mm. Braking, too, was also addressed in the rally-bred GT-R; the master cylinder was altered and the discs were up-sized to 274mm (ventilated) at the front and 280mm (solid) at the rear. That represents a 21 percent increase in swept area over the GT-X. Perhaps due to its rally routes, the basic GT-R comes void of ABS - except where the 'option pack' was ordered - this gives ABS and a sunroof. One of our criticisms of the Familia GT-X was its low-ratio rack and pinion steering - the GT-R answers this with a 2.6 turn lock-to-lock 15.4:1 ratio (rather than the GT-X's 16.9:1). Despite the extra beefing up that took place pretty much across the board, the GT-R weighs only 30kg more than the standard GTX's 1180kg mass. 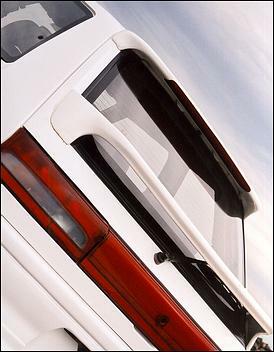 Yet another 30 kilos are added with the combined ABS and sunroof option - bringing the highest total up to 1240kg. Note that the GT-R j-u-s-t met the contemporary Group A legislation that called for a 1200kg minimum weight in the 1.8-2.0-litre category. The only thing that detracts from the GT-R's flow of speed is the turbo engine's response and torque curve - if the crankshaft is not spinning at more than around 4000, there's isn't enough grunt to really haul you from the apex and toward the next corner. 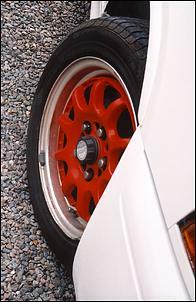 Mazda had saved cash on the GT-X by fitting 14-inch steel rims - but the GT-R called for 15-inch alloys clad in 195/50s. Note that the GT-R has 5 wheel studs, whereas the GT-X and other Familias have 4 - a quick and easy way to spot the genuine article. As we said with the GT-X, the Familia cabin offers plenty of room in the front, but it gets a little 'knees-up' in the back whenever the front pews are rolled back. Seating in the GT-R, however, is subtly improved over the GT-X with a full set of leather/fabric sports seats - though some people complained they weren't very comfortable. Like its lesser brethren, the GT-R's instrumentation is clear and relatively simple, with just an odometer, tacho, temp and fuel gauges. Standard on the GT-R are power windows and mirrors, climate control, central locking, a Momo steering wheel and matching gear knob. It's all very functional. 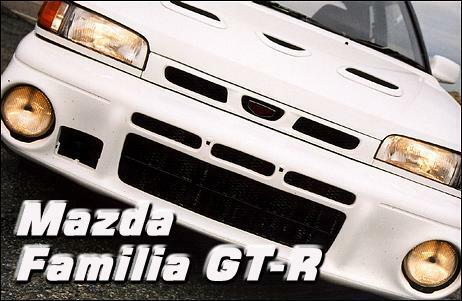 With only 2500 examples built in around 1992, the Familia GT-R is a reasonably collectable machine. You'll always have to pay for that. Being a second-hand Japanese import means you can't (legally) drive a Familia on Australian roads without it being fitted with a compliance plate. 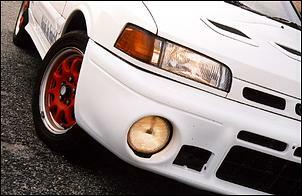 Once fitted with one of these (and the accompanying modifications that go with it! ), a GT-R should set you back less than $20,000. Our test vehicle - which had 87,000 kilometres - was stickered at $16,500 (complianced and on-the-road). Note than un-complianced Familia GT-Rs can be bought for thousands cheaper than this - and they're ideal for anyone wanting to get into some rallying. If you're thinking about buying a Familia GT-R, make sure you have it thoroughly mechanically checked. Bear in mind - due to its myriad of revised parts - identical replacements may be difficult to source. 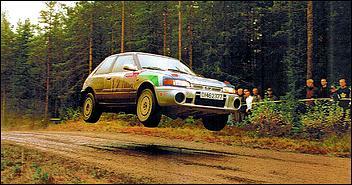 Also, be wary that many GT-Rs have already been used for rallying. In our previous test, we said the GT-X was "a good all-round performer...either around town or on the highway - it's very capable." Well, the GT-R has more of the good stuff - but it isn't anywhere near as flexible. If you're mainly going to be driving in urban conditions, we'd suggest that a GT-X (perhaps with a few basic power mods) would be a better-suited car; it has far superior point-and-squirt. The GT-R, however, is great for charging up a mountain road when there's adrenalin flowing every inch of the way; you really need to keep it wound up and on-boost. Under these conditions, its brakes, steering and suspension come together exceptionally well. Power is pretty reasonable too. Also, note that almost any other 10-year-old near-20k car will offer you a better feel of quality. The Familia's paint and panels are all fine, but - for example - the doors are flimsy and don't shut particularly well, and some of the switchgear operation is a bit rough. Mazda has already given the GT-R engine a dose of aftermarket-style tweaking - but it doesn't mean you can't get any more power out of it. As mentioned, the standard exhaust is still quite restrictive, and a 3-inch mandrel replacement would certainly result in improved power. It's also said that the standard airbox is quite restrictive, so this can modified (or replaced). And - of course - a few more psi boost wouldn't go astray. We're told that the GT-R runs up to 10 psi, so we'd guess that 14 psi should be able to be tolerated without hassle. The standard (larger than GT-X) air-to-air intercooler should still manage okay at these levels - but an additional water spray system couldn't hurt it. With these mods, we'd expect anywhere up to 30 percent more power from the GT-R - up to around 200kW. 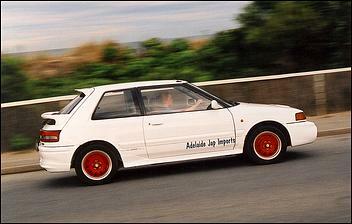 Thanks to Adelaide Jap Imports for making our test car available.